Despite potential protest to the contrary, Jordan Cooper's opening salvo against reductionist law-gospel presentations should be welcomed by confessional members of both Lutheran and Reformed churches. In support of his tradition, Cooper puts forth Hands of Faith: A Historical and Theological Study of the Two Kinds of Righteousness in Lutheran Thought which seeks to regulate the law-gospel scheme and reduce the stereotype of Lutherans as persistently deemphasizing the third use of the law, sanctification, and Christian ethics. Cooper introduces the doctrine of "two kinds of righteousness" as a paradigm for the Lutheran church moving forward (and away) from reductionist tendencies. By evaluating historical attempts at the doctrine (chapter two), its existence in the writing of Luther (chapter three), and its enumeration in confessional documents (chapter four), Cooper places the doctrine on a steady stool for application from the pulpit and private lives of believers. In chapter two (titled "Two Kinds of Righteousness: Three Proposals"), Cooper's interaction with Joel Biermann's A Case for Character: Towards a Lutheran Virtue Ethics is particularly helpful (pg. 26-35). The distinction of "passive righteousness (justification), active righteousness (sanctification), and civil righteousness (the righteousness that benefits society regardless of faith)" is helpful not only in its Lutheran context but to Christians of all traditions. Believers are as guilty of conflating and misunderstanding justification and sanctification, the "two kinds of righteousness" paradigm provides a clear starting path for theological development. In conclusion, Jordan Cooper's Hands of Faith: A Historical and Theological Study of the Two Kinds of Righteousness in Lutheran Thought is substantially easier to read and treasure than to cite by name. Pertinent to Lutherans and Reformed communities, Cooper helpfully navigates the over extended law-gospel schema regularly depicted in its reductionist form. The historicity and value of "two kinds of righteousness" thinking are presented clearly by Cooper and should be commended to all looking for further instruction on the Christian life, ethics, and sanctification. 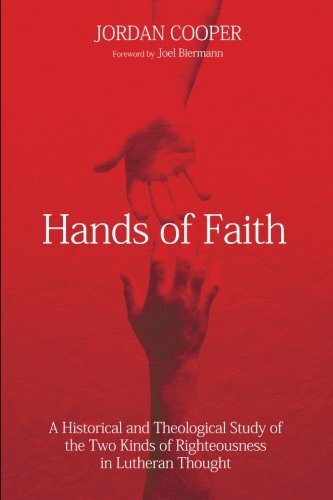 Additional blogs on Hands of Faith can be read here.